Designing a home is about more than just defining your style and choosing furnishings. It’s not about having a remodeled kitchen or achieving that coveted open concept. It’s about clarifying what matters to you and creating a space that supports and encourages those values. Ask with your highest priorities and values in mind: Who will use this space? What activities do I want to see happen here? Home is the venue that hosts daily living especially for families with children. It includes creating traditions and routines, hospitality, the building of relationships, how we nurture our health, as well as educational, artistic or musical pursuits. What do you REALLY want? What’s the real outcome you want to see from life lived in your space? The small choices we make about how we do this daily life end up determining, in the end, the life we have led. So the space that we occupy - our home - is a key player that will help us to achieve the life we want. The good news is… you can create an environment that helps achieve all the goodness you want for your family - and budget has very little to do with it. I take what you already have, add what you need, and make it all work together so you LOVE YOUR HOME. You talk, I listen. We'll discuss ideas and possible solutions. I'll take notes and make suggestions. I'll leave my notes with you or you can hire me to transform your space so that you love your home. Using the furnishings you already own, I’ll restyle your room. If new furnishings and decor pieces are needed, I’ll source them and extend trade discounts to you. Paint is one of the simplest ways to update an interior or exterior but doing the work is an investment and getting the color wrong can be expensive. 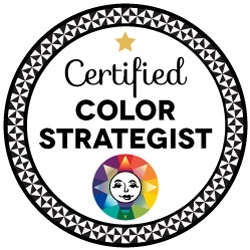 I'm a certified color strategist who can help you choose the right paint colors so you can have a home you love. Thank you! I can't wait to learn more about your home! I'll be in touch within 36 hours.